When you hear of a once in a blue moon show from your favorite blues rock band you do whatever it takes to make it to the show, even if it is on a Wednesday and in the heart of San Francisco. 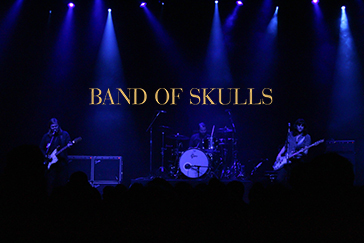 Returning once more to the Fillmore and touring in support of their 4th studio album, By Default, the Southampton trio Band of Skulls packed the house for a mid-week show. With a solid set list and intimate low lit stage presence, frontman Russell Marsden promised a mix of both old and new fan favorites. Opening the set with a song from the new album “In Love By Default” Marsden asked if everyone was ready for a good time, to which the crowd responded with a roar of applause. The energy remained in high gear throughout the set even during the slower songs like “Honest” and “Cold Flame.” Bassist Emma Richardson and her fierce bass take the lead during a few of the songs including “Patterns” and “So Good.” We were surprised with a drum solo from Matt Hayward mid set as well. It was great to see each piece of the trio showcasing their talents throughout the evening and a beautiful way to transition between songs. While their U.S. tours may be few and far between being they are from across the pond, they are always evenings full of beautiful music and good times. If you ever hear they will be stopping by your town, even if it’s on mid-week work night, spend the night out with Band of Skulls. Check out www.bandofskulls.com to purchase By Default, see when they will be stopping by you next, and more.